Need an easy breakfast idea your kids will love? 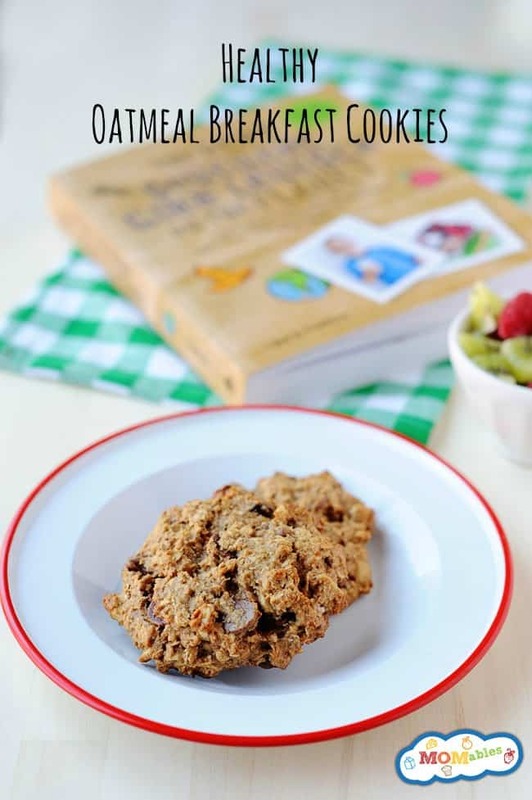 You’re going to love this oatmeal breakfast cookie recipe. They are simple to make, and you can easily double the batch and freeze them! Now, that’s ultimate convenience right there! Don’t they look amazing? I mean, what’s not to love about oats, peanut butter, honey—yum. I will tell you that while the original recipe calls for 1/2 cup of honey, you can cut it down to 1/4 cup and still achieve a delicious cookie. This recipe is also in my cookbook, The Best Homemade Kids’ Lunches on the Planet along with other breakfast favorites. Check out how easy these cookies are to make in this short video. If it looks like a cookie and tastes like a cookie, then it must be a cookie! said Cookie Monster on Sesame Street. It is—sort of. This is a breakfast favorite in our house. Little does my family know that these cookies have protein, fiber, vitamins, minerals, and omega-3s. Sssssshhhhhhhhh! Don’t tell them! Yes, I let my kids have a “cookie” for breakfast, but you know it’s way better than some of the processed breakfast foods found at the store. At least I know it’s made with real ingredients, and they are filling. Preheat the oven to 350°F. Lightly coat two cookie sheets with cooking spray, and set aside. In a large bowl, stir together the banana, peanut butter, honey, and vanilla. In a small bowl, combine the oats, flour, flax seed, milk powder, cinnamon, and baking soda. Stir the oat mixture into the banana mixture until combined. Stir in the cranberries. Using a ¼-cup measuring cup, drop mounds of dough 3 inches apart on the prepared cookie sheets. With a thin metal or small plastic spatula dipped in water, flatten, and spread each mound of dough to a 2¾-inch round, about ½ inch thick. Store in an airtight container or resealable plastic bag for up to 3 days, or freeze for up to 2 months. Thaw before serving. You can reduce the honey to 1/3 cup, or substitute with maple syrup. Whole wheat flour can be omitted and substituted with oat flour or gluten-free flour mix to make this recipe gluten-free. WANT MORE IDEAS LIKE THIS ONE? WE'D LOVE TO SEND YOU SOME. I have not tried it but I don’t see why not in this recipe. Enjoy! Hi There, I am dying to try this, but don’t have nonfat milk powder, what else can i substitute in for this? you can leave it out. don’t worry! My daughter sent me this recipe. I made them for an afternoon snack when I need a boost of energy and something to keep me from snacking my way to dinner. Would you please publish the nutritional information, especially the protein and fiber content? I have made these a few times now and these are my husband’s new go-to quick breastfast in the morning. My 3 year old likes them too and he’s pretty picky! They are really yummy and easy to make and freeze. I even quadrupled the recipe this last round. Felt I should leave a comment. Since I have made about a thousand of these cookies since I discovered it six months ago. Thank you, thank you, thank you!!!!!!! Best idea, best wholesome breakfast cookies ever! My special needs diet four year old loves these. I am diabetic,so instead of honey could I use liquid sweetener? My 4 year old son is allergic to soy and wheat. I used sunflower seed butter (instead of peanut butter), raisins, gluten free flour, gluten free oats, and vanilla protein powder. He absolutely LOVED them! He had 2 large cookies for breakfast. But, unfortunately had bad diarrhea afterwards! The only thing he hadn’t had before was the protein powder. It didn’t have soy or wheat in it. So it shouldn’t be a reaction to his allergy. Maybe too much fiber in 2 cookies? If it’s due to the protein powder, can I just use more flour? The protein powder is just for a nutritional boost. You can omit it and still have delicious cookies without having to add extra flour. 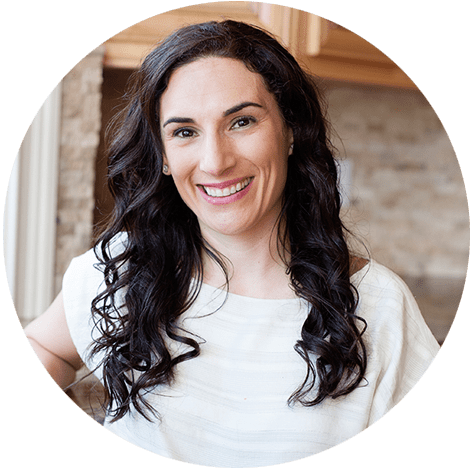 I love this recipe because the energy that I get from it is very balanced (great fats and proteins) and I can use what I have on hand. Thank you. So glad you enjoyed it Lori! Love this recipe! Seriously, these cookies were an instant hit and will be a staple, even for my picky husband. They taste wonderful and keep us satisfied all morning if no time to make smoothies. I’ve tried so many breakfast muffin/cookie recipes and haven’t been excited about any of them until now. I used the nsn whey vanilla protein powder we love that’s made with stevia and because we’re not huge fans of honey, used equal parts honey and light agave nectar. With no flax seeds on hand I tried psyllium and it worked beautifully. Had golden raisins left over from making raisin bread so used those and have learned we prefer them much better then dark raisins. Normally oats can give me some tummy problems but the psyllium must have countered that effect because I have had zero symptoms with these. I also used Michael’s suggestion of using muffin tins and liners at 340° for 18 minutes, but still lightly smoothed and flattened tops with wet spoon. The top texture came out a perfect crispy sweet and the inside delicious but might add a little water or add’l fruit next time. This recipe is so versatile it will be fun experimenting. Can’t wait to try carrots and/or diced apples and spices to make a morning glory type muffin/cookie as well as the chocolate protein powder and chips someone else tried. Thank you so much for sharing, you’ve solved a decades old problem in our home!! Do you have a suggestion to replace the banana? My daughter can’t have banana, avocado, or apples. One egg per a banana. Enjoy! Every time my daughter comes home for a visit from college, I send her back to school with a batch of these. She loves having them for a quick breakfast or snack, and I love knowing that she has a nutritious option. Although she prefers them fresh, if I make a large batch, she freezes some of them. When she wants to eat one, she’ll pop it in the microwave for 15-20 seconds and it’s good to go. Thank you for the great recipe. It’s served us well for the past 4 years! This was awesome! I used a tablespoon of coconut flour instead of regular flour and added an egg (due to the coconut flour). I also cut the honey to a 1/3 cup and added chocolate chips. No one in my home is allergic to nuts so I was thinking that would be a good addition as well! Love that this has a good amount of protien as well. Thank you! I tried the recipe as written but for some reason they turned out dry and too textured. My kids didnt eat beyond 2 bites. What am i doing wrong? I am not sure what occurred but here are some suggestions: use quick oats next time, cook a little less time (your oven might be a bit too hot and might need less time) to yield a chewier cookie. Enjoy! These are delicious. I’ve made them as written aBut also love how versatile the recipe is. Today I threw in pumpkin seeds, chia seeds and slivered almonds, and subbed raisins for the craisins. They are GREAT!!! These are amazing! I did not have flax so I used chia seeds and my banana was small so added shredded carrots! What a great recipe for a pre-workout meal. 8 grams of protein also! Do you have the nutrition facts for these? I track calories and would love to make these. Hi Kim! You can plug in the ingredients you use to https://www.caloriecount.com/cc/recipe_analysis.php to figure out the nutrition facts! I made these as written, just substituting some sorghum for the honey at a 1::1. I docked this recipe at just over 1/2 c. per cookie (so, large). It made 9 cookies. I recommend strongly (anytime you’re making a bar-type cookie like this, a cookie that’s meant to have some tooth and texture) that you refrigerate the dough before baking. So, used a 1/2 c. scoop, plopped the cookies on a sheet, refrigerated about an hour, and then baked. They stood up really well and have a terrific texture. Sweet, dense, deep. Thanks, MOMables. About as good a healthy brekkie bar as you’re going to find. I don’t have any kind of milk or protein powder. Is it really necessary for this recipe, or can I substitute something for it? You should be able to leave it out, but if the dough is too sticky, slowly add more flour 1 tablespoon at a time. Thanks for the nutritional information as I am trying to stay under 400 calories per meal. I could even eat 2, if I was still hungry after their first one, or make one a midmorning snack. Sounds like a great recipe. I’m going to try it tomorrow after the sun comes out as we are on a solar system here in Kauai. 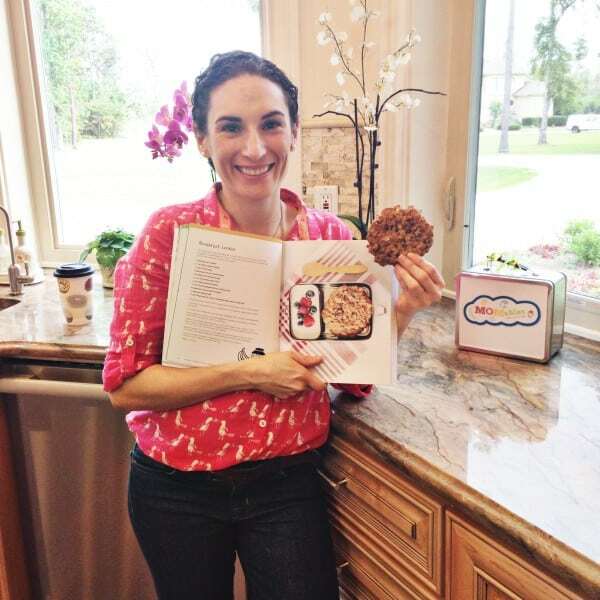 I’m tracking my calorie intake too and these came out to be 279 each (my batch made 9 cookies total) using the exact ingredients Laura listed, plus I added 1/4 cup chocolate chips – 250 calories without chocolate chips. Super yummy and fairly filling. I paired it with my morning coffee, so it did feel like a full meal for me. I plan to try dried apples instead of cranberries/raisins for another flavor type! Hope this helps! Apple chips as the add-in sounds delicious! If we like the first batch (in the oven at the moment), I’ll make another batch with apples tonight. Thank you for the suggestion! Just made this for tomorrow’s breakfast. Didn’t have vanilla protein powder or craisens so I used chocolate protein powder & coconut flakes instead. Omitted the cinnamon since that wouldn’t be very good with chocolate. Turned out great!! Thank you! Love this recipe. However I tried it both with natural peanut butter and almond butter and my kids much preferred the almond butter ones. Tasted more like a cookie to them. I also used large flake oats so I am hoping that these were ok instead of the rolled oats. I find it so hard to figure out which oats are which. Thanks for sharing this recipe. Good one to put in the lunch box too!! I’m glad you found what your kids like! I love making recipes that are great for the lunch box. This recipe is great! Thanks so much for sharing it! I used chocolate protein powder and mixed in dark chocolate chips and they are so delicious! I really like to prep meals ahead of time for the whole week and had been struggling o find that go-to breakfast for busy mornings. This will for sure fill that slot for me.Next week I will try it with pumpkin, since I have some left over canned pumpkin in the freezer from this week’s dinner. you can freeze after baking, but microwaving causes all flour content items to dry out. try microwaving with a damp paper towel covering the cookie. I do this to thaw bread all the time. Do you mean baking it and leaving it at room temperature overnight? Just made a batch…. Popped them in the oven just now. They are a little wet and gooey… I’m 11 btw and this is my first time cooking alone. I over cooked them a bit…. Oh well! I have a second batch. 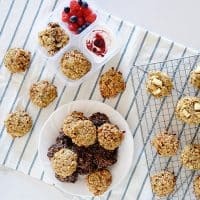 What kind of oats are best for this recipe? Can you use Old Fashioned Rolled Oats? Thanks! Kaela, rolled oats is what the recipe calls for. Yes, old fashioned oats. Enjoy! These are great! My toddler loved them and so did I! I subbed 2 medium eggs for the banana, dropped the honey to 1/3 cup, and split the mix-ins with 1/4 cup each of dried cranberries and chocolate chips. I’ve previously used a different breakfast cookie recipe but I think this will be my go to now! I doubled this recipe, except for the honey; used 1/2 honey and 1/2 brown sugar. My flax seed isn’t ground so I threw it in whole, added cloves (cuz I love them), raisins, coconut and cinnamon chips. My son thinks they’re “ok”, but my husband, who doesn’t usually care for cookies much, LOVES them! I could do with less sweetener, but I’m not changing anything because he’s requested them again! I made smaller, regular sized cookies, and got 5 dozen. I bake 1 pan/day, put the dough in the fridge, and let it warm a bit before I bake the next batch. Lasts the whole week. Healthy AND delicious! Just wondering if you have tried these with chocolate protein powder instead of vanilla. It’s all I have. absolutely. if that’s what you have use that! :) it can also be omitted. you are welcome to plug the ingredients in a recipe calculator. enjoy! Yes, I am needing the nutritional info on this as well. My daughter has type one and we need the carb counts. Thanks! As mentioned in a previous comment, we do not calculate nutritional information but you are welcome to plug it in to a recipe calculator. Please note that these are giant cookies and I would not advise that large portion for a child with type 1. These are totally fine for a kid with type 1! I appreciate your concern, but as a mom, RN and a diabetic for over 30 years I can say with confidence that as long as you figure out the carbs, it’s all good! BTW- LOVED these cookies!!!! Thank you for this delicious recipe! My family loves these. Can’t wait to try more of your recipes. Laura, thanks for sharing this. Will try it without the banana – my son is allergic to banana (any idea for substitution? ) Could you please share more breakfast ideas that doesn’t have banana in the ingredients? I know it’s going to be challenging for you with all the allergies out-there (dairy, gluten, nuts,eggs) and now I am adding banana to the list :-) Love your site tho! You can typically substitute bananas (by volume) for eggs or pumpkin in any recipe. If you omit it, it will become a “dry” recipe. The bananas are part of the moisture and binding agent. No worries. I’ll try! I used applesauce instead of banana, but I also substituted brown sugar for the honey. I thought it might be too much moisture in the recipe if I kept the honey. Plus, I have somehow ended up with a surplus of brown sugar recently. Anyway, it turned out great! Big thanks for this post! I’m crazy low on groceries and will go shopping tomorrow, but needed something to pack in my 6 year olds lunch box in the morning. This will pair great with the last apple and a few other little things we have left. You saved me from having to grocery shop at midnight. Thank you! I hope they enjoy it! This is a great idea. Definitely going to try it this week. Should be great for those mornings we are literally running out of the house! Hello..I am from India..so the cup sizes in measurement varies..It will be great help if you share the ingredients in gm..also can ¼ cup nonfat milk powder be omitted and replaced by oatmeal or oat flakes? We only publish in US cups. Perhaps you can convert online. I have never tried replacing it. I use convertit.com if I need to make conversions. Great website. I have a daughter allergic to bananas. I was wondering if I could sub pumpkin? Any suggestions on how to go about this? I’m glad I found this recipe! I had to switch out the flaxseed and protein powder for coconut flour, if you heat flaxseed above 250 degrees the nutritive value starts to break down. it turned out well but a tad dry. I think next time I’ll try adding coconut oil or even some butter. Thanks for posting this! Just finished making these…. wow, delicious!!! I made these gluten free by using almond flour in place of the wheat flour. I also used almond butter rather than peanut butter and used pure maple syrup in place of 1/2 of the honey. These turned out great! I’m looking forward to playing with it and creating different variations. My son is allergic to peanuts and tree nuts. I am planning on substituting the PB with sunflower seed butter, which is his favorite. It has a similar taste and consistency to PB, so I think it should work. I’ll let you know how they turn out. Thanks! Sunflower butter should work fine. Try “No-Nut Butter”. Its a GREAT substitution for nut butters and tastes better than Sunbutter (in my families opinion). I’m trying to eat better and these are awesome! These will keep me from hitting the supersized muffins and the convenience store next to my office! These turned out great! 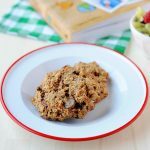 I have been trying countless breakfast cookie recipes and LOVE this one. Thanks for a great recipe! I woke up this morning and looked for a breakfast cookie recipe and found this. Yes I am nuts at 6am just finding a recipe and chancing making it before I have to get the kids up AND while I’m making and packing lunches. But it was SO quick and easy and filling, definate hit! I will def keep this one and play around to see what other combos of stuff I can come up with for it. :) I’ll try a version with sunbutter and applesauce for my son as well. Just made these for breakfast and they were so good! Even my picky two year old ate one and said it was “so yummy”! Love that these are so portable, too. I know these will become part of my regular rotation. Thanks for such a great recipe! I haven’t made it without any protein. I’ve done soy protein instead and they came out great. I finally made these tonight. I used 1/4 c of almond milk instead of the milk powder bc of food allergies. I was afraid it would be too runny but they turned out just fine. Next time I might do as you suggested with another commenter about adding a little more oats if using liquid milk. But they turned out great. I also can’t have cinnamon due to a sensitivity and subbed 1/2 tsp of nutmeg and 1/2 tsp of allspice. It turned out fine but I think I’ll add a little more spice next time. The best part, I told my toddler I made her a cookie and she gobbled it up!!! Thanks for the recipe!!! Another great hit with my family. Had them for breakfast today for the first time. All 3 kids gave them a thumbs up. My hubby even took one to work for an afternoon snack. Thanks so much for the recipe. So glad this was a hit Netty!! Great breakfast cookie. I made the recipe without the milk powder and they turned out great! Love MOMables! These are delicious and I am so thankful to have found this recipe. My daughter loves them, I love them, and my husband who doesn’t like 99% of the ingredients loved them! Thank you for sharing! awesome!! it’s such a versatile recipe too! My boys loved these! Me too! One asked me to put more raisins in it, so will go with a little more on the next batch. so glad! i make a batch every other week or so. I love that this recipe is very giving and you can add all sorts of dried fruits and nuts! I made them with blueberries and lemon zest two weeks ago. came out delicious! I can’t stop making these! I wanted to let you know that I was almost done putting together the ingredients in a bowl today and realized I had bought quick oats instead of rolled oats. The recipe still turned out. I did end up adding 2 TBSP of water so it wasn’t too thick. But the texture was slightly different. Hmm, less body or texture and instead just soft? It’s hard to describe. Still tasted delicious! What is the best way to freeze these? Just put them in a ziploc? Or should I wrap them in plastic wrap individually and then put in ziploc? Any advise? I made a double batch today and want to freeze some. Thank you! So glad you love these! There are two ways of freezing these. 1) mix dough, make cookies lay on cookie sheet and place uncooked cookie sheet in freezer for one hour. then, transfer to zip bag. this way you can pop them in the oven anytime you want (this is what i do most of the time). 2) make cookies. let cool then transfer to cookie tray, freeze and transfer to zip bag. when you need them, pull out, defrost by warming 30sec in microwave. This recipe is so awesome! My kids are so picky and breakfast always stresses me out because they need good nutrition to start the day. They LOVED this recipe!! I used a jar of baby carrots and plum baby food that I had left over instead of the banana. YUmmm!! Thanks for the recipe!! what a great idea of substituting carrots!!! thank you Cara for letting us know that your kids loved it! I love the sounds and idea of this cookie, but can not sent nut products to my son’s school, so no good for his breakfast and/or snack there. We have almond butter…but alas…still nut. Any ideas on non-nut substitution for the pb? Thanks, never heard of sunbutter before. Just looked up a recipe and have a good use for those raw sunflower seeds in my fridge now too! :) Do you think subbing the milk powder with more ground flax, wheatgerm or bran would be okay? Thanks for the tips! Thinking of giving this a try on the weekend, to prep for the crazy weekdays – would be a nice change from muffins I think! If I don’t have the ground flax can I just add more flour? What about adding nuts? Would that effect the dough in a negative way? Hi Lisa! yes, it’s dry milk powder. if you use it liquid it will make the recipe too runny. you can always use the liquid and add 2-3 TB more oats to thicken it up if you don’t have powder around. Kimmie- I’m not sure! Since you went ahead and tries it… Would you let me know how they come out and what you substituted? I’m not a big banana flavor fan. Do these have much of a banana flavor to them? What would you recommend adding instead of banana? Jenny, I don’t think they have a strong banana flavor but you can substitute 1/2 cup apple sauce. My sis hates bananas and cranberries… What do I do?? swap for eggs (2) and raisins. they are not banana-y cookies. Any mashed fruit (or veggie.) Zucchini, squash or pumpkin might be fun too. Or carrots. It substitutes for the oil, so these would work in cake mixes, muffins, and other cookie recipes as well. If it’s a chocolate flavored mix or recipe, you can add virtually anything! I used peas and spinach baby food in my daughter’s chocolate cake mix instead of oil and *no one* noticed. Not even AFTER being told it was in there! No way!!!! What great tips, thank you! You just made our morning so much simpler. They are delish and the kids can even eat them in the car. & nutritious too! Thanks! THANK YOU Myrna! Love to hear that!! I love breakfast cookies! And so do my kids. Can’t wait to try this recipe – It sounds delicious! Do you have any nutritional info on these? How many cal, fat g, protein, etc Thx! We used fresh pb (no sugar)but as follows here is what our chef calculated: Per cookie: calories 180, 6.8g fat, 7g protein, 23g carbs 3g fiber 10g sugar. Note: the recipe is loaded with good for you things (like omega 3s & 9s) from the ground flax seed. Definitely a winner! BTW, the cookies are BIG. so you can make them half the size too. Discovered this recipe yesterday and just so happened to have all the ingredients so I made them this morning for breakfast. Enjoying now with my coffee and SO happy I tried. These are SO tasty and I can’t believe there is no butter or added sugar. Thank you MOMables! Awesome! I always have a batch hanging around during the school year because they make the perfect on-the-go breakfast. Hey, if it’s a “cookie” they eat it! LOL Thanks for letting us know you enjoyed them! 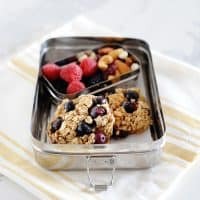 Sample meal plan, free recipes, and all the tips you need to make school lunches and meals easier.